On the Intents page, select Add prebuilt intent from the toolbar above the intents list. Select the Utilities.Cancel intent from the pop-up dialog. After the intent is added, train the app by selecting Train in the top, right toolbar. 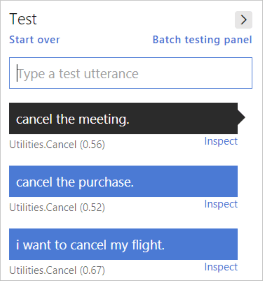 Test the new intent by selecting Test in the right toolbar.